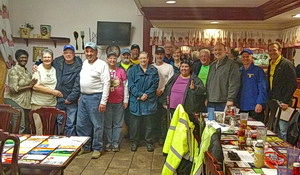 Spyder Riders of Broken Arrow (SRBA) is a growing, family oriented group of local Spyder enthusiasts who enjoy riding their Spyders in and around "Green Country" Oklahoma. SRBA members also enjoy attending events sponsored by other organizations in the area and surrounding states. For the most up to date list of recent and future SRBA events be sure to visit our "Events" page. Safety is paramount when riding in a group; so Spyder Riders of Broken Arrow follows the Motorcycle Safety Foundation's Guide to Group Riding. Please download a copy of MSF's Quick Tips Guide and visit our "Safety" page for additional safe-riding information. As a matter of safety when you ride with SRBA the lead and sweep riders are in constant contact with each other to help ensure a safe and enjoyable ride. Our monthly meeting is held the first Monday of each month, except on rare occasions when those days fall on a holiday. We meet at our local sponsor the Apple Barrel Cafe at 3806 South Elm Place (across the street from Robertson Tire) in Broken Arrow. Meeting starts at 7:00 p.m. but you are welcome to arrive about an hour early and join us for dinner. Bring your ideas of where you would like to ride. If becoming an SRBA member is something you are considering you can download the SRBA Member Application and return it by mail. Or simply bring it with you to our next meeting or any of our events. Dues are $20.00 per individual or $35.00 per couple per year payable beginning January 1. After July 1 they are $10.00 and $20.00 respectively. Membership is not required to ride with SRBA nor is riding a Spyder.